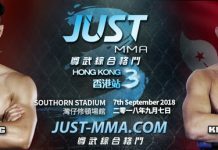 On September 7th, “JUST MMA – Hong Kong 3”, two of Hong Kong most talented bantamweight fighters, Max Leali and Roberto Medalla will go head to head in front of the Hong Kong crowd! Since 14 years old, Max Leali has been training in Brazilian jiu-jitsu and MMA with the intention to go professional. 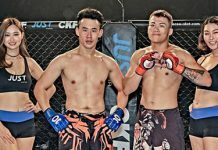 Coming off a dominant win over China’s Cao Zhen Hai in JUST MMA – Hong Kong 2 in March, Max Leali is going to face one of his toughest opponents up-to-date, another top fighter in the Hong Kong MMA scene, Roberto Medalla. A BJJ purple belt, Roberto Medalla has proven to be well-versed in his striking and grappling department. 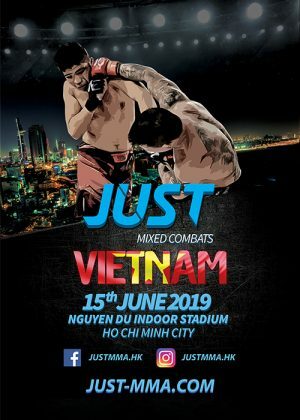 With both men hammered their way out for their victories at March’s JUST MMA – Hong Kong 2, this fight between Roberto Medalla and Max Leali is not a match to be missed.